December 02, 2018 - The study of the charging of a battery at atomic resolution is an advance that promises the ability to inspire the design of future carbon-based energy storage systems. The process has now been observed at the atomic level with the in situ TEM SALVE. September 09, 2018 - A new study examining transition metals in carbon nanotubes and published today in Nature Communications was carried out in the Group of Electron Microscopy for Materials Science at Ulm University. March 15, 2018 - Researchers from Free University Berlin, University Erlangen-Nürnberg and Ulm University have defined the mechanism on which chemical synthesis of graphene from graphite is based. October/November, 2013 - The radiation damage in MoS2 under the electron beam at electron energies of 60 and 80 keV can be largely avoided by encapsulation between 2 graphene layers. As two groups of researchers at the University of Manchester in collaboration with the SuperSTEM laboratory (both UK) and at the University of Ulm (Germany) independently and consistently reported, the radiation damage in the beam-sensitive 2-dimensional transistion metal dichalgonide (TMD) is reduced by several orders of magnitude. September 24, 2012 - A team of scientists from 6 European countries, including the the Universities of Aalto, Vienna, Helsinki, and Ulm, the Institute of Nanoscience of Aragon, the Laboratory for Microstructural Investigations Chatillon, and the Max Planck Institute for Solid State Research Stuttgart, has combined STEM, HRTEM, and computational methods to study the electron beam damage in carbon nanotubes and graphene with nitrogen dopants. July 17, 2012 - Scientists from the Universities Helsinki and Aalto in Finland, the University of Ulm in Germany and of Vienna in Austria studied the behavior of 21 representative two-dimensional atomic crystals under electron irradiation by employing first-principle simulations and compared their results in the case of MoS2 with experimental data on the production of vacancies in HR-TEM images. The study provides insights into the effects of electron irradiation on TMDs and the modification of their physical properties about which very little is known today. 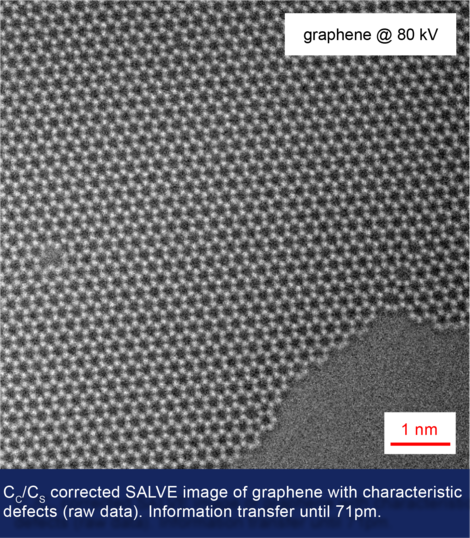 October 24, 2011 - A new study unravels the transformation of carbon adsorbates on graphene into amorphous or crystalline carbon monolayers at extremely high temperatures. innovations-report.de "Lithium atoms on the move"
November 27, 2018 - You can call it simply a sensation, what has been achieved by scientists from Stuttgart, Ulm and Dresden. 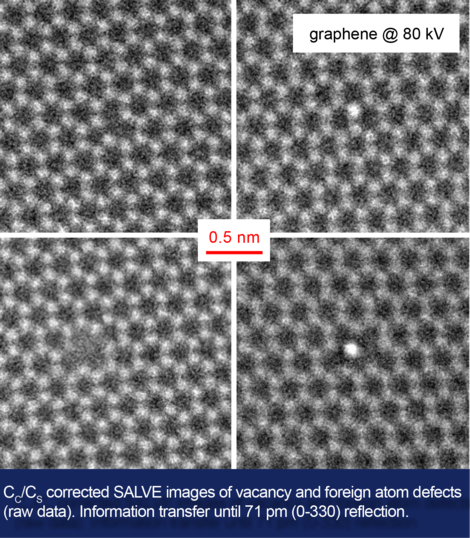 Using the Sub-Angstrom Low-Voltage Electron microscope (SALVE), they were able to show in atomic resolution how lithium ions behave during electrochemical loading and unloading processes. Altmetric.de "Private life of nanoclusters"
September 10, 2018 - Cao et al. has received a score of 103 in a very short time for the media impact of "Comparison of atomic scale dynamics for the middle and late transition metal nanocatalysts". The work is ranked 78th place out of all publications of Nature communications and is in the top 1% of all 11,729,579 articles across all research outputs ever tracked by Altmetric. Chemie.de "Synthesis of graphene understood"
March 23, 2018 - Researchers from Freie Universität Berlin, Friedrich-Alexander-Universität Erlangen-Nuremberg (FAU) and Universität Ulm have made a significant contribution to the wet chemical synthesis of graphene from graphite, defining the mechanism on which it is based. Suedwestpresse "Super-Microscope SALVE moves to the University of Ulm"
September 29, 2017 - Since today Ulm University offers another superlative: the most advanced low-voltage electron microscope in the world. Nature Nanotechnology research highlights "Single molecule chemistry: Caught on camera"
Advanced Materials Interfaces Front Cover "High Performance Li/S Battery"
October 06, 2016 - The article by Vinayan et al. has been selected for this months front cover of Advanced Materials Interfaces. July 10, 2013 - The German SALVE 2 electron microscope is being redesigned to limit noise. Physical limits mean that electron microscopy may be nearing highest possible resolution. For the comment article by Pennycook et al. see section "Other highlighted topics" (November 2014) on the SALVE homepage. August 2018 - Researchers of the Electron Microscopy for Materials Science at Ulm University have filmed the private life of 14 different nanoclusters and analyzed the classified their findings together with the scientists from the Nanoscale and Microscale Research Centre in a new Periodic Table of Elements. 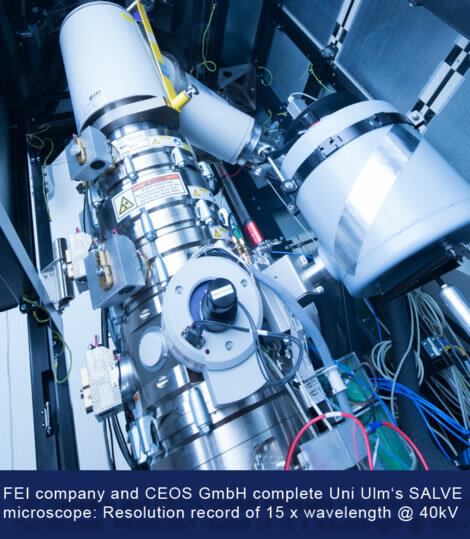 October 2017 - The group of Electron Microscopy for Materials Science at Ulm University announces the inauguration of the SALVE III microscope and the SALVE building together with the 3rd SALVE symposium in December 2017. The events are part of the 50th anniversary celebration of Ulm University. 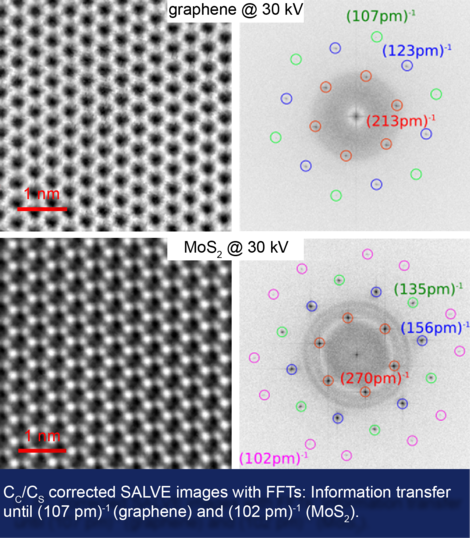 January 2017 - Scientists from the group of Electron Microscopy for Materials Science (EMMS) at Ulm University studied single–layer 2D MoSe2 in an aberration-corrected high-resolution transmission electron microscope operated at 80 kV. November 2014 - S. J. Pennycook from the University of Tennessee and S. V. Kalinin from Oak Ridge National Laboratory, USA contribute in nature to the discussion about constantly increasing resolution electron microscopy that was raised by the article "Imaging hits noise barrier" by E. S. Reich including contributions from U. Dahmen (TEAM project) and D. A. Muller (Cornell University), see section press on the SALVE homepage.